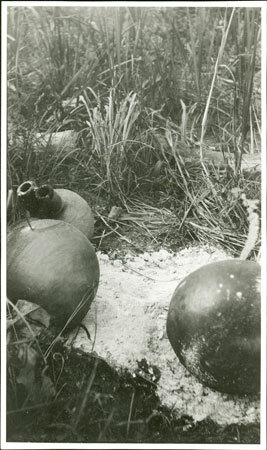 A group of three large rimmed pots (one with double aperture) lying on a pile of hot ashes having been removed from firing. Notes on print/mount - "pots after firing 72/3 3 EPA688"
Notes on card mount m/s pencil - "SS upper LH + RHS & SSS overall 'pots after firing' 8.89"
Morton, Chris. "Zande pot making" Southern Sudan Project (in development). 03 Jan. 2006. Pitt Rivers Museum. <http://southernsudan.prm.ox.ac.uk/details/1998.341.688.2/>.